Here is a Bitcoin trading strategy that I have been running since November 2017. In fact, it was after Vince Stanzione’s crypto seminar that I started looking at ways to trade Bitcoin. 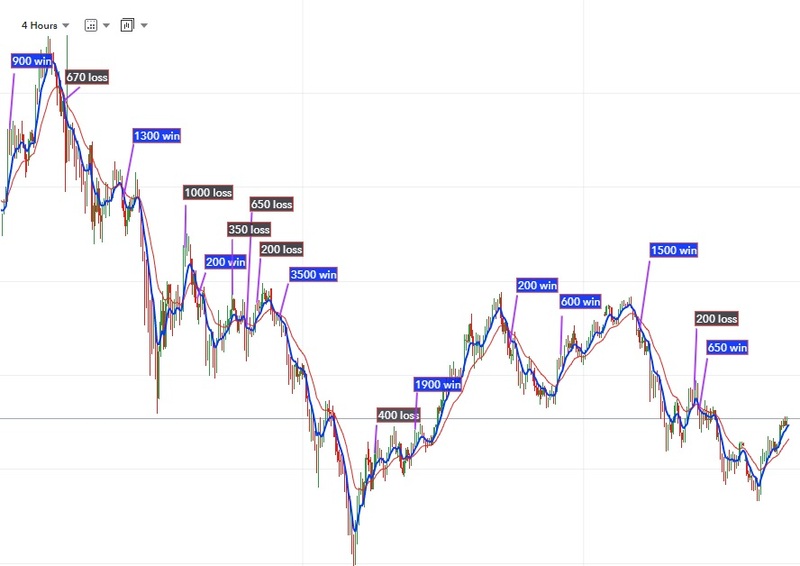 Vince Stanzione uses one day charts to trade Bitcoin. And combined with his trading strategies it works fantastically. But for some, using the daily charts means that your stop losses may be too big to stomach. This will in most instances put your position into negative as soon as you open it, unless there was some sort of mad price swing just as you opened the trade. As well as the spread that you get charged, the margin that IG request you to use to trade Bitcoin can be huge. For example, a 0.30p a point trade on Bitcoin with IG will require a margin of just over £900. This is partly fuelled and due to the fact that the stop loss distance required is a whopping 860 points minimum. But hold on… there’s more to it than that. You can’t just jump head first in to the fray and follow the crowd when it comes to Bitcoin trading. Doing so will probably mean you lose money. Even if you manage to call the right direction, you’ll find that you are left licking your wounds after your stop loss gets triggered because of some wild swing that occurred for no apparent reason. This is where a simple Bitcoin trading strategy comes in and is basically essential for success. The Bitcoin trading strategy that I have been testing since November as performed brilliantly over that time. In fact the results you could have achieved or at least somewhere near are very encouraging. Considering that we are only using one simple indicator with this trading strategy makes this all the more impressive. Also, you won’t need any fancy charting packages or need to subscribe to any of the like. The free IG charts are all you need to trade Bitcoin successfully. However, because of Bitcoin not being traded for any serious length of time, [as it happens only since December 2017 when the CBOE added it to their exchange] Has the option [no pun intended] to trade Bitcoin been brought to the masses. This means there is obviously a lack of historical price data [compared to other established currency pairs] to use in analysis. All we are using to create a winning strategy that has netted over 7000 points profit this year  already, are 2 exponential moving averages. As said, the first issue that I had when developing a new strategy was that there was very limited historical data to go by. This meant that it was going to be practically impossible to draw any accurate support and resistance levels. This was then combined with the fact that there had only been one trend… and that was up. Now though, almost 5 months later, there has been and is enough price data and price swings to claim that this strategy works. We can see that there has been a big range of movement up to almost 20000 any right back down to 6000. But using some simple trading skills and adding a moving average to the chart, we can see how easy Bitcoin has actually been to trade. Let’s zoom in and take a closer look. You can see clearly that I have added an exponential moving average with the periods 6/18 to the chart. Now from the start of 2018 if we had traded every crossover signal on the chart that our EMA [exponential moving average] gave us, our results will have looked something like this. You can see I have added the trades and approximate points won or lost at each crossover. I have rounded the results off to the nearest 50 points in most cases. As always though, I have tried to be as accurate as possible. I have calculated the results from logical entry points at the crossovers. The trades have then been left to run until either stopped out or until the next crossover signalled to close the trade and change direction. Stop losses were put strategically at points of recent highs before the crossovers, just above the crossovers or at the high of the previous candle next to the entry candle. Enter long, BUY, when the 6 moving average crosses up over the 18 moving average. Go Short, SELL, when the 6 moving average crosses beneath the 18 moving average. The reason that I used a moving average with this strategy is that again there is a lack of data to successfully use support and resistance lines or any other indicator that I consider useful. This lack of data makes it harder to get the bigger price picture. Using the moving averages are helping us take the guesswork out of our trading. That obviously helps a lot when trading Bitcoin at the moment. You can play about with the settings of the moving averages and you may find that a different combination of settings or values works better for you. This 6/18 is what I found works best for this particular 4 hour Bitcoin chart. I say that as these 6/18 settings will not necessarily work as well on another currency pair. This is what you need to remember about technical indicators and trading. There is not one set of rules that works across the board for everything. Don’t be afraid to test things out using different timeframes [candles] and different periods of moving averages. Even though this system is probably one of the best that you will see at the moment to trade Bitcoin, something else might suit you better personally for whatever reason. As time goes on and more price data becomes available, we will be able to use support and resistance lines, candle patterns along with moving averages. This can help give us an even clearer idea of price direction and therefore may help in making more informed decisions. However, and certainly at the moment, using 4 hour candles and exponential moving averages has created a valuable strategy for trading Bitcoin. Unsurprisingly, due to the volatility you will need quite a big point’s balance in your trading bank to trade Bitcoin. Bitcoin can still be very unpredictable and because of this combined with how much Bitcoin can move in 4 hours, stop losses tend to be quite large. Although as you can see from the above diagrams and crossover signals, stop losses are really hit and the rewards are mainly larger than our initial risk. There is no set stop loss figure that I have found that works regularly when trading Bitcoin. Each trade is individual and finding strategic points to place a stop loss will vary from trade to trade. One of the best places to put a stop loss is just above the moving average crossover, but this still [and obviously] doesn’t guarantee that you will be safe. Sometimes it’s better to put a stop loss at the most recent high or low and sometimes it is preferable to put the stop loss at the high of the last candle. The best idea when it comes to taking profits from your Bitcoin trading is to close the trade at the crossover signals and open a trade in the opposite direction. This eliminates the need to stress about profits and takes out the decision making out of the whole trading scenario. The other alternative is to set a risk reward ratio and set a profit target. So if your stop loss is 800 points then you can automatically set a take profit target at 1600 points. This can work well for some people. The theory being that you will create a positive outcome over time as the win odds are stacked in your favour. The downside to this take profits strategy is that you can miss out on some of the bigger wins. Sometimes you can also miss the smaller wins too. As said though, each to their own, and it is whatever suits you best. Without a doubt, over the coming year there will be many opportunities to trade Bitcoin and many chances to profit from other crypto currency’s. Also it is important not to forget that there are still many other opportunities trading other currencies indices and individual stocks that can make great profits from. For example, you may be trading with the DAX, USD/EUR for a regular source of profits and income, so adding a small position of crypto currency is into that portfolio could be deemed as sensible. Just don’t put all your eggs in one market so to speak… unless of course you are a specialist in that one market… some traders only ever trade the DAX, USD/GBP or the S&P for example and make amazing profits. 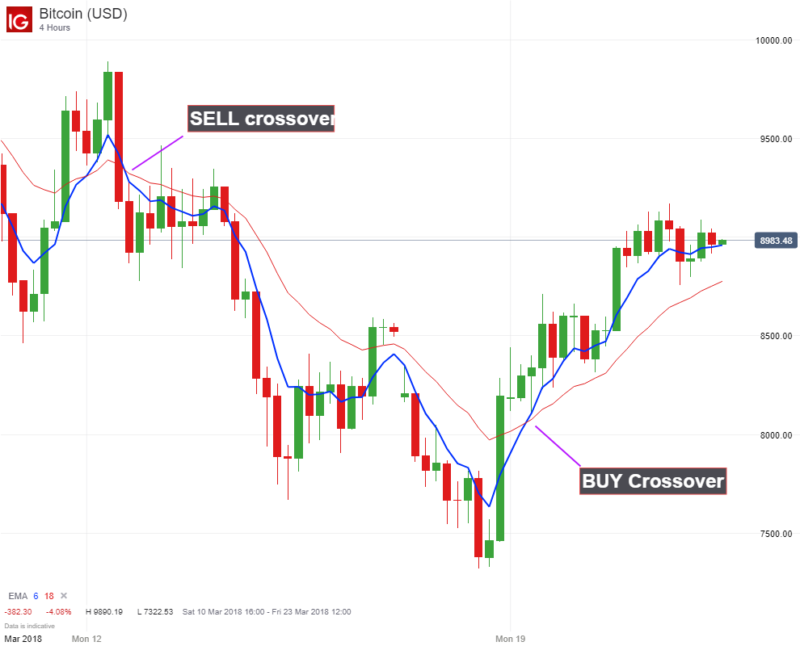 The above rules may seem too simple to ever be profitable but I can assure you that moving average crossovers have accounted for some of the biggest wins and profits I have ever seen from trading the financial markets. Don’t believe me? Just ask Vince Stanzione if moving averages can really help you make money trading! If you are new to trading then you really need to test the Bitcoin trading strategy out first by paper trading it, preferably using a good demo account with one of the reputable spread betting firms. You see, it’s all very easy for you to see the wins and losses like I have shown above. However, it is far harder than you may think to accurately place a stop loss so that you are kept in the trade, but are safely out the market if there is a crazy price move. Plus you want to avoid your stop losses getting hit and concentrate on closing a trade manually when you are Bitcoin trading. Especially if you can see that the price has gone against you. There is no point in waiting to get stopped out when the stop losses requested to trade Bitcoin are so huge. Add into that the fact that your own personally psyche will determine if you are able to let your profits run or take pre-determined profit targets as I have already explained. If you have already had some experience with spread betting and trading, it is still advisable to tread cautiously when you first start to trade Bitcoin. It’s better to learn well and earn smaller than it is to charge head first into the trades and lose big. As with all trading, it is patience and discipline that also play key factors in how profitable you will be overall… that and a sound banking strategy too. 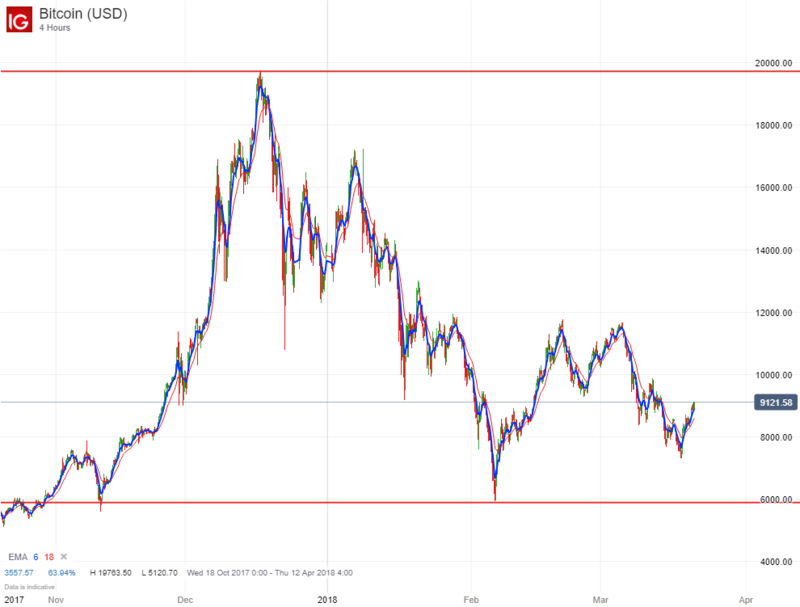 Bitcoin trading is no exception to the rule. Most spread betting companies offer a demo account. IG offers a good one and you can use their charts and learn the trading ropes directly on their platform. Using a demo account is a good way to become accustomed to spread betting and trading. But don’t get to cocky when you start to win… new traders often find it a different game all together when they start to trade with real funds. Of course you can always just watch the price and monitor your results. But by paper trading like this you are not getting the real vibe of trading. If you are not using a proper trading platform like the spread betting companies can offer, you’ll then have to learn how to do that once you do decide to spread bet with real funds. You may as well start out with clear intentions and get things right from the start. Plus, all the demo accounts are free to use and open. So there you have a good strategy for cashing in on the Bitcoin trading rush. You won’t win every trade you make… that is just fairy tales. But you will win more points than you lose over time by following the simple crossover rules and using the 4 hour charts.